I am very excited to share this new book with you! 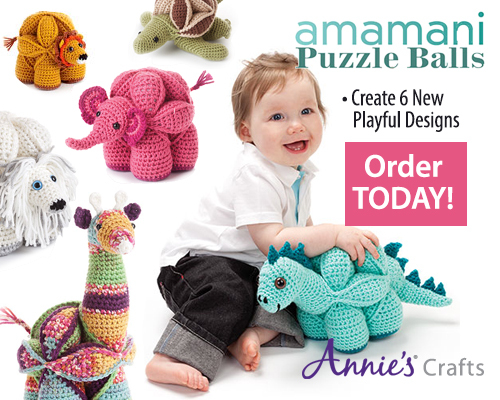 Amamani Puzzle Balls (short for: Amigurumi Amish Puzzle Animals) are inspired by traditional Amish Puzzle Balls. 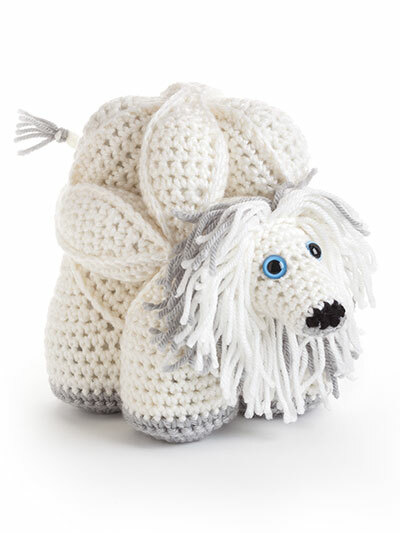 Each Amamani Design is comprised of three segments (or rings) which fit together to form a sturdy and cuddly toy! Here is an example of the three segments which you assemble to make Dexter. The instructions included in in this publication are fantastic! The book contains colour photographs, diagrams (where they are needed) and detailed, step-by-step written directions. You will be amazed by how these come together! I have had the chance to crochet one of Dedri’s Amamani Puzzle Balls in the past and I loved making it. Dedri kindly sent me Dexter to play with (I also allowed Drew supervised visits with our UK friend!) and my son has fallen in love with him. Dexter is sturdy and soft and so very loveable – my children adore these animals and I love challenging adults to try to put them together! 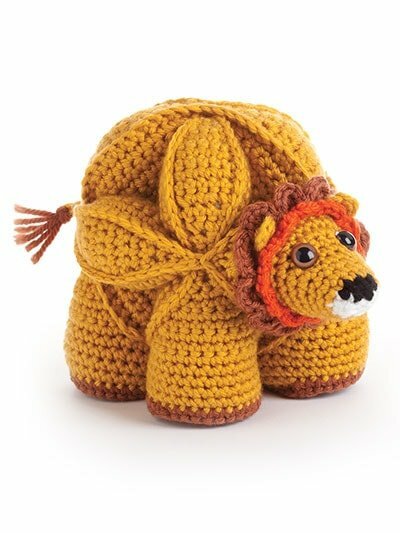 I hope you are inspired to try one of Dedri’s fantastic designs – they are so unique – and they make truly one-of-a-kind crochet gifts! and…Dedri has generously donated a copy of Amamani Puzzle Balls to be given away to one of my lucky readers! So you can make Dexter too! Enter below for your chance to win your very own copy of this unique crochet book! As always, you get a daily free entry so come back tomorrow to enter again! I bought the book and I’m making Brill. I’m stuck on how to make the legs. Help. Ì love those Amish puzzles, but the english version is to steep for me. Love to have the whole book in dutch, but couldn’t find it. Found 3 patterns in dutch, but they are still hard for me to make. But they are so cute !! 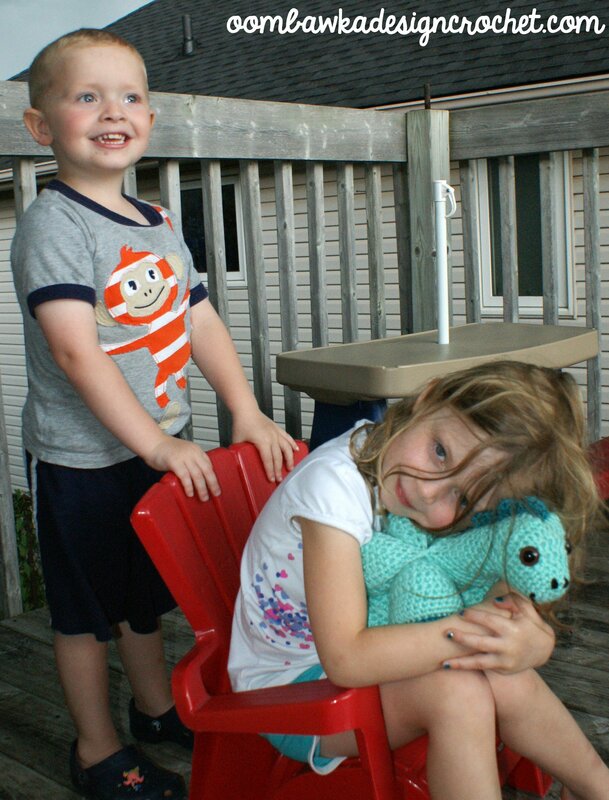 They are such fun to crochet too! We have a number of amamani puzzle balls in our house now! Love your patterns Dedri! Looking forward to making some more! Just love these little critters! Love your creative talent Dedri! Thank you for sharing with us! 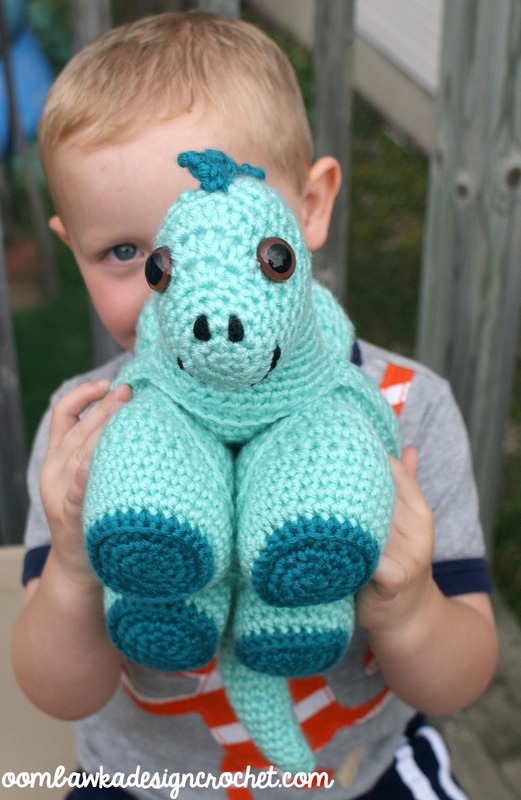 Eventually I would most likely make them all, but would start with the dinosaur for my grandson. I would make the Dragon first. Thank you for the opportunity to win one of your awesome books. You are a very gifted and talented artist! Dexter the dinosaur first for a certain young lady I know who is obsessed with all things dinosaur related…. Great patterns! I love them all but really like the dinosaur. Dedri is amazing! I would probably make the dinosaur first if I had this amazing book. I would love to try these. Would be fantastic for my great grandsons. They’re all so cute! I would love to make the white lion first though! Oh my goodness!! They are adorable! I know a lot of little ones that would just love on of these. I would have so much fun making these. I’m sure my grandsons would love the dexter and brill. But I’d love to make any of them,,, so adorable. too hard to decide would have to ask my 3 yr old granddau for her choice. They are all soooo cute and cuddly. I would make them all. The first would be the dinosaur. Just too cute. I would make Gemina the Giraffe! I think they are all great, but I would make the dinosaur first. 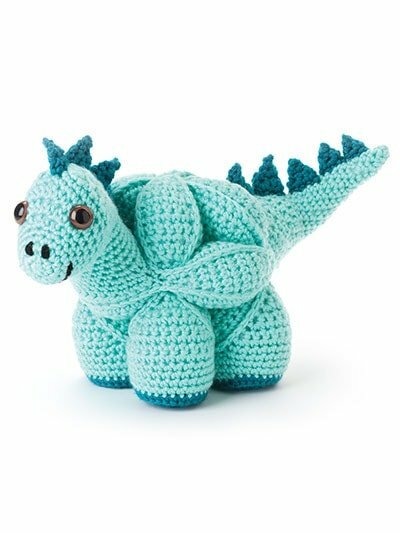 The dinosaur would be my first project but definitely not my last! These are so amazing. I would make the dinosaur first. I would make the white lieon first! I would make the puzzle balls and donate them to the local Shriners Childrens Hospital!!! I like the elephant the most, but I would make all of them if I won the book! These are so amazing. I wish I was talented enough to come up with designs, but for now all I can do is follow everyone else’s patterns! Thank you for the opportunity to win this fabulous book. I love the giraffe!! Thanks for the chance to win!! I would make the dino for my son first. 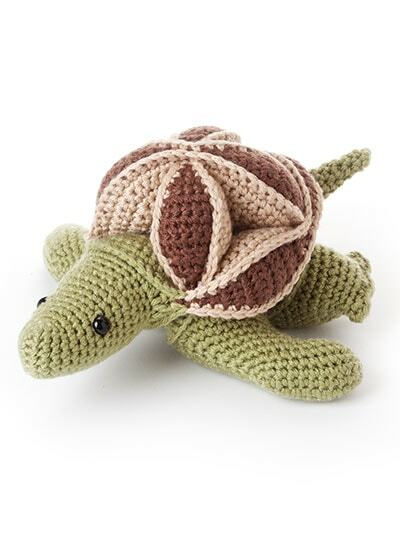 I’d love to make the turtle. They are all adorable! 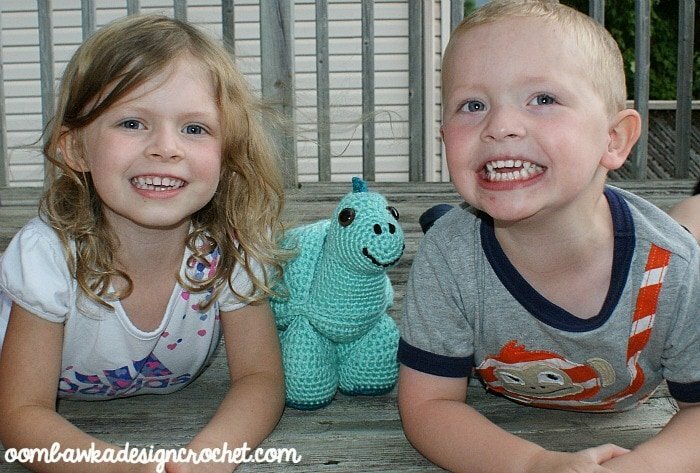 I would love to make either the Dinosaur or the Turtle. The are so darn cute!! I love them all but would probably make the giraffe first!! Love this idea-so unique and cute! I don’t tweet but I have made two balls and the octopus. I love these things!! I think I’d make the turtle first. I would make the white lion first! So cute! I love these! I think the giraffe is so adorable! Then again I am a sucker for giraffes. I have been following your blog for awhile and very much like your designs and patterns. Thank you for the chance to expand my learning curve! I would make Dexter and Gemina, well all of them really! This looks so wonderful! Would have to make the pink elephant for my grandniece and the dragon for myself! I want to do them all! 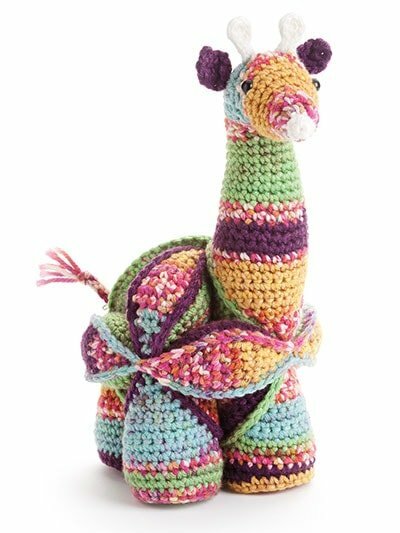 I would love to make the giraffe! I would make Dexter the Dinosaur because my son is crazy about dinosaurs! I would definitely make the dinosaur first followed by the giraffe. I would love the challenge of making all of them! I am sure that any women’s shelter would be happy to receive these for the kids that come in with their moms. It would be a tremendous challenge to do it and do it right, but a great reward knowing that they may become a terrified childs comfort. I would love to make all of them. If I had to choose it would be the Dinosaur. I would MAKE ALL THE AMAMANI!! I love that turtle. I’ll be making that first. Those look absolutely adorable, I can’t wait to try to make them. Will need to buy the book if I don’t win it. My son would love the dinosaur. Thank you for the opportunity to win this book. I love your creations. God bless! I think the elephant would be absolutely ideal for my 6 month old Grandson Oliver! I love these and will be really nice gifts. I think I will start with the giraffe. 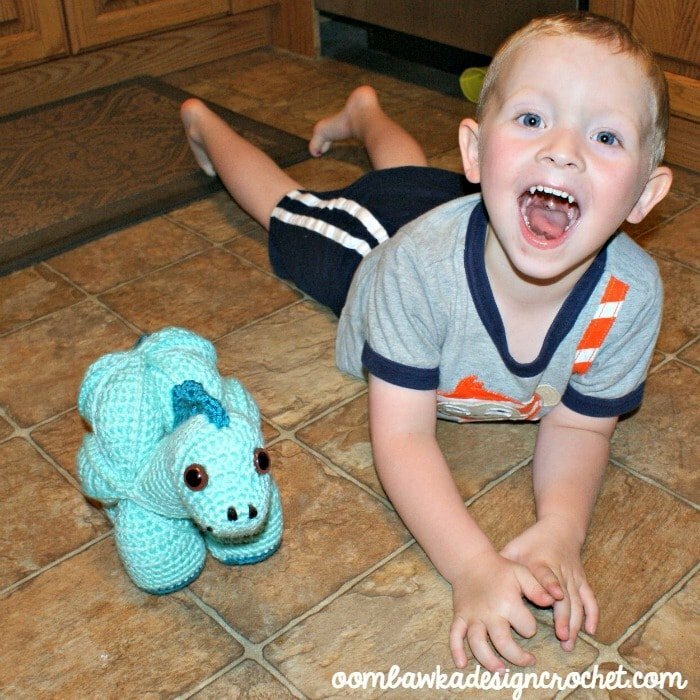 I would start with making Dexter the dinosaurs, one of my soms loves dinosaurs ! He wants a dinosaurs bedroom too, so that would be GREAT in it !! I tested a few of Dedri’s patterns for her, they are so much fun to make, easy to follow and when finished a hugh succes for kids and grown ups also !!! I really love making them and giving them away as a present to see the reactions on everyones faces !!! What a fabulous book. Would love it in my library ! 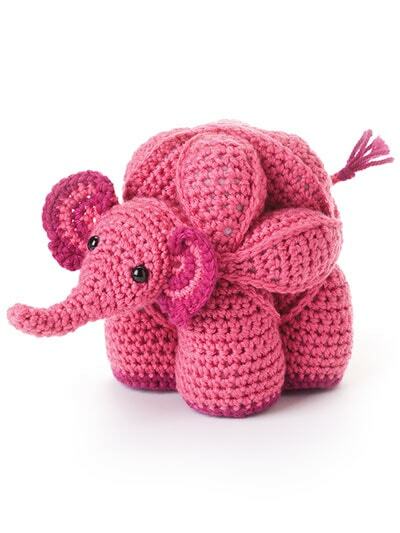 I want to make the elephant! I would make the elephant first! I love elephants…but then I would slowly make every single oe of them because I have seven grandchildren. These patterns are so creative and I think you have a great talent Dedri. Thank you for making your pattern booklet available now to the world. 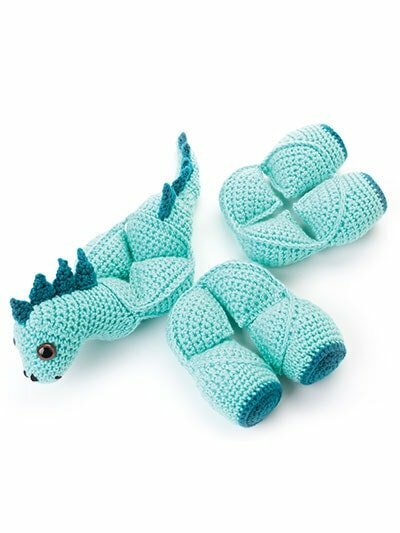 I’d like to make the super cute dinosaur!! Would LOVE to make these for my grandchildren in “Igland”!! These are cute to make and donate to the cancer children along with the hats I crochet!!! I would like to make Eleanor the Elephant first…. They’re all so cute, but I’m kind of partial to turtles and elephants. I would make them all! Not sure which one I’d make first…maybe Dexter…he’s so cute! but – hmmm! they’re all adorable. I LOVE Dedri and all of her designs – and her tutorials have helped my increase my own abilities. It’s so exciting when I can do a pattern without a tutorial now….because I can harken back to doing stitches with Dedri! Invisible joins are second nature now – as are standing sc, dc, etc.! And Rhonnda you are also right up there on my favorites list! Look forward to your emails every Saturday! I would just have to make the dinosaur first. My grandaughter is crazy about dinos . I am sure I would eventually have to make them all. They are awesome looking. Thanks for the opportunity to enter to win this book. I know whoever wins will be happy! I’ve been wanting to make an Amish puzzle ball for ages, and an animal one would be even better! I would make Skillie the turtle first. I just love these. I would definitely make the white lion first. I even know who will be the receive that little gem. My granddaughter! I am torn between the dino and the elephant… Those 2 are my favs, but I love all of them so much. I just love Dedri’s patterns! Wow! All of them really, but I’ve just fallen in love with the giraffe! Ah! And thanks for making it open worldwide!!! I want to make them all, but I love the giraffe! I would make them all but Gemina the Giraffe would be made first. The turtle! 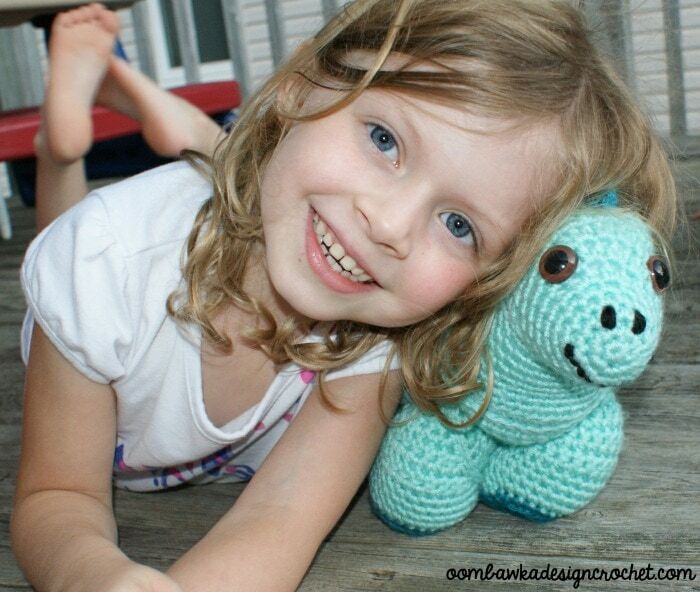 They’re are so cute but I’d make the turtle first! :D. Thanks for the chance to win! What a great idea! I would love to make these for our church nursery. Thank you for your generosity! I would make the Elephant first! But have to really make them all they are so adorable. Thank you for the chance to win! I love all of them. I would love to make them for my daughter. But I would make the giraffe first. I’d make the white lion or elephant first. I would make the elephant first. I can’t wait to try making them.